I tried to read Bertand Russell's History of Western Civilisation but struggled to get through it. After reading The Quest For A Moral Compass I had a much better framework to work from and was able to return to Russell's book and enjoy it. Kenan Malik is one of the unsung intellectual giants of our time. My favourite passage is from page 23. Socrates now asks his most important question, one that two millennia later still causes consternation. Is it Pius he wonders being loved by the gods because it is Pius, or is it Pius because it is being loved by the gods? Unless the gods love something for no good reason, then they must love something as Pius because it inherently possesses value. But if it inherently possesses value, then it does so independently of the Gods. It cannot be Pius, as Euthyphro supposes, simply because the Gods love it. In this remarkable and groundbreaking book, Kenan Malik explores the history of moral thought as it has developed over three millennia, from Homer's Greece to Mao's China, from ancient India to modern America. It tells the stories of the great philosophers, and breathes life into their ideas, while also challenging many of our most cherished moral beliefs. 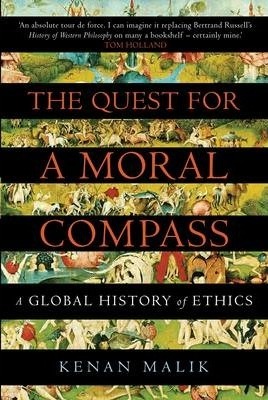 Engaging and provocative, The Quest for a Moral Compass confronts some of humanity's deepest questions. Where do values come from? Is God necessary for moral guidance? Are there absolute moral truths? It also brings morality down to earth, showing how, throughout history, social needs and political desires have shaped moral thinking. It is a history of the world told through the history of moral thought, and a history of moral thought that casts new light on global history. At a time of great social turbulence and moral uncertainty, there will be few histories more important than this.